We asked the most trusted name in business how many advertising messages a person sees per day, and Google’s response was 4,000-10,000. That stat is for the average American but is relevant for the rest of us as well. It includes out-of-home (OOH) advertising, digital ads, broadcast ads, print ads, and mobile ads. How are brands possibly expected to break through and stand out from the other 9,999 messages? Outstanding creative is one way, but let’s be honest, this is not so easy to achieve! The same goes for clever media placement. If your brand or agency can successfully identify and secure a unique media spot, that’s great! Otherwise, there has to be another way to get your message to stand out. Around the world, printing shops are beginning to offer large format 3D printing for visual communications. When brands incorporate 3D printing into their OOH advertising, the work stands out. Literally. Just look at these examples. Circle K is a convenience store chain with locations all around the world. Here is how they announced in Denver, Colorado, that the stores are selling full-strength beer. This beer-bottle bus shelter sure gets attention. The six-pack bottle tops were 3D printed by Media Resources on their Massivit 1800 and took 10 hours to print each pair. That’s seven. We present #8: Adding 3D elements to billboards — it is proven to attract more attention and influence greater recall. We recently blogged about the stats and research behind this in Big News For Billboards And Out-Of-Home Advertising (OOH). 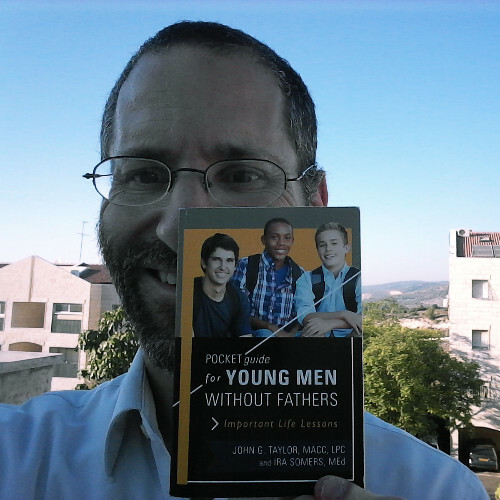 You can see for yourself what the research is claiming in this stunning example. 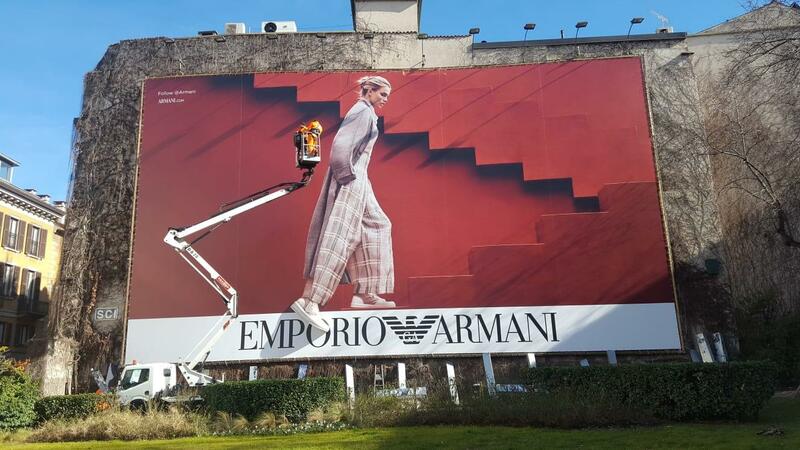 Emporio Armani’s billboard by Colorzenith perfectly portrays the power of 3D. 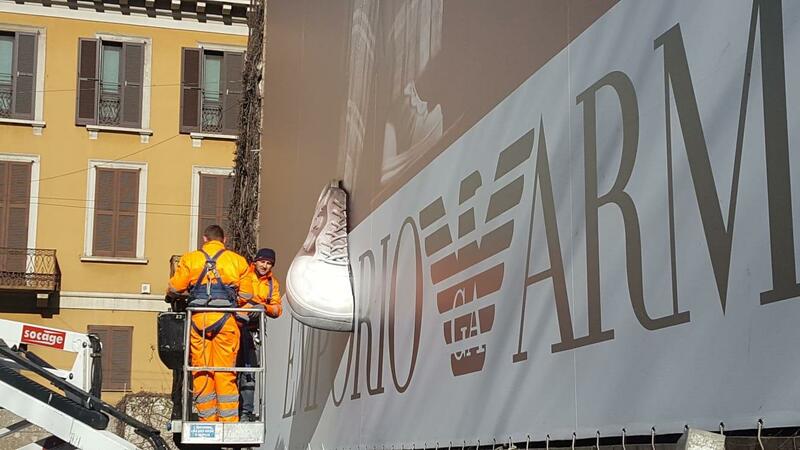 The 3-dimensional shoe becomes the focal point and brings the model to life, even though it is small relative to the giant 78 ft. x 46 ft canvas. Look at the impact it has on the OOH display. By the way, the shoe is the object of the ad. Speaking of objects, if you are creating an omnichannel experience for consumers, 3D printing can help. You can carry over elements from your brand’s digital marketing campaign to your OOH messaging and in-store displays. With large format 3D printing, you can duplicate icons, characters, or words from your brand’s campaign by 3D-printing complementary signage, displays, or other types of OOH ads. Children’s National used OOH for a fundraising campaign, placing 500 “Dr. Bears” around Washington D.C. as well as in the hospital itself. Each bear was equipped with a computer chip and a light. Every time somebody submitted a donation, all the bears city-wide would light up to excite passers-by. . .and serve as a further trigger to donate. Composite Images 3D-printed this giant sunscreen bottle for Nivea and cruised along a crowded Sydney, Australia beach. This bottle could be designed in Australia and printed in locations around the world to run the promotion on many beaches. Also, bottles could even be printed with each city’s name for that hyper-local feel. Besides the immediate and localized boost of brand awareness, the selfies, likes, and shares that followed reached a much wider audience. If guerrilla marketing is your thing, the ability to 3D print any shape, form, or object opens up your possibilities to create whatever object-centered guerrilla marketing campaign you imagine. When you have the freedom to create anything, you improve the chances of getting your brand’s message to stand out. That’s your goal, and large format 3D printing can help you reach your goal. Faster. Learn more about incorporating large format 3D printing in your next advertising campaign.